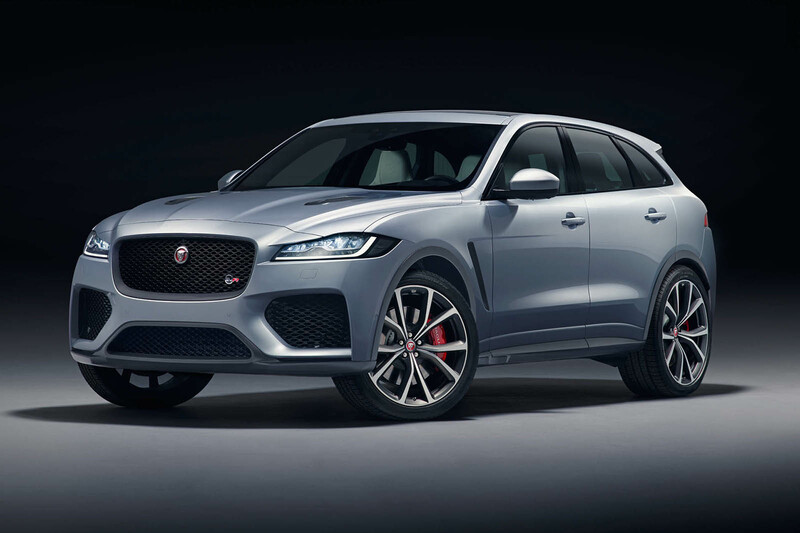 This is the Jaguar F-Pace SVR, the first-ever high-performance SUV made by the brand as it looks to exploit the model’s massive sales success and capitalise on booming demand for fast high-riding cars. 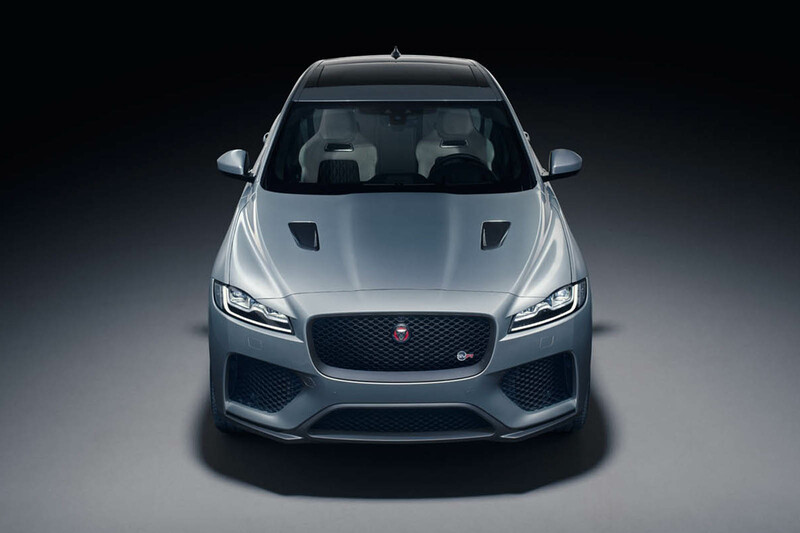 The F-Pace SVR is the second Jaguar SVR after the F-Type and has been developed by Jaguar Land Rover’s Special Vehicle Operations (SVO) division. Intriguingly, it has been launched before any high-performance versions of Jaguar’s new saloons – this also underlines the market shift away from such cars. At present, there are no plans to launch an SVR version of either the XE or XF, besides the limited-run XE SV Project 8 that was made for a Nürburgring record attempt. Powered by a 542bhp, 502lb ft supercharged 5.0-litre V8 petrol engine, the F-Pace SVR delivers a 0-62mph time equalling that of the original F-Type V8 S’s 4.3sec, despite the new car’s 2070kg kerb weight. Highlighting the rate of development of modern cars, it also matches the 0-62mph acceleration of the last-generation Audi R8 V10, launched in 2009. The F-Pace SVR’s top speed is rated at 176mph. As such, on paper, it outpunches such rivals as the Porsche Macan Turbo, which, in Performance Package set-up, produces 428bhp, hits 62mph in 4.4sec and has a top speed of 169mph. Jaguar used the Macan as a benchmark in the development of the car, along with performance estates from Audi Sport and Mercedes-AMG. 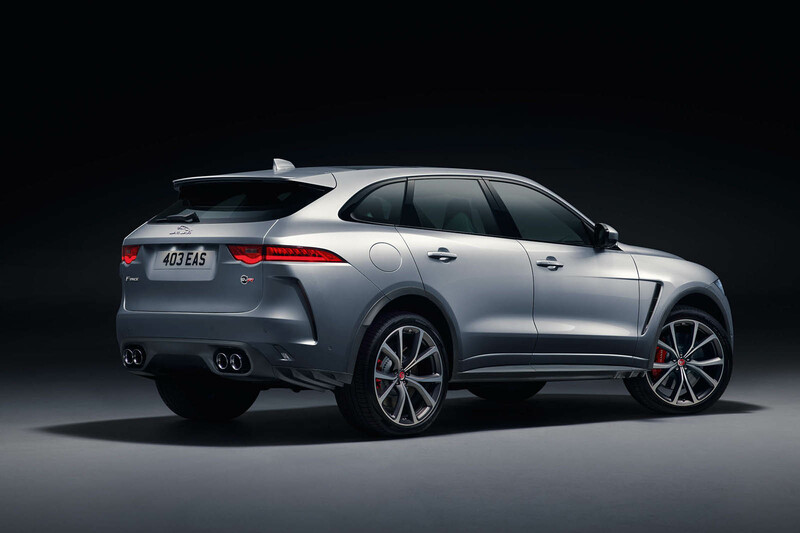 There are rivals that eclipse Jaguar’s performance claims for the 0-62mph sprint, including the Mercedes-AMG GLC 63 S (503bhp, 3.8sec to 62mph, 155mph top speed) and Alfa Romeo Stelvio Quadrifoglio (503bhp, 3.8sec to 62mph, 176mph top speed). Although the V8 has been used across previous Jaguar and Land Rover models in various states of tune – including in a more powerful 567bhp form in the F-Type SVR and Range Rover Sport SVR – the SVO engineering team has worked on giving it bespoke characteristics to suit the SUV’s dynamic abilities. A key component of the car’s dynamic performance is Jaguar’s rear Electronic Active Differential (EAD). The SVR model is the first F-Pace to use this system. It was initially developed for the F-Type and plays a central role on the SVR version of that car, helping to maximise torque to each wheel with the car’s all-wheel drive system. It has been tuned specifically for the F-Pace SVR, as has the adaptive suspension, electronic power-assisted steering set-up and the available driving modes, the most aggressive of which is called Dynamic and initiates faster gearshifts, sharper throttle responses and more alert steering behaviour. Jaguar also says it has fitted springs that are 30% stiffer than the standard F-Pace’s at the front and 10% stiffer at the rear. Combined with a new anti-roll bar, they contribute to a 5% reduction in body roll. However, SVO dynamics manager David Pook said the F-Pace SVR is not an overly firm car with an uncomfortable ride and offers greatly different characteristics between its driving modes. The 21in and 22in wheel options – forged to a new, lighter design – are 25mm wider at the rear than the front, contributing to the car’s handling characteristics. Jaguar has revealed that the 22in wheels are 2.4kg lighter on the front and 1.7kg lighter on the rear than standard. Both new wheel designs were created to deliver greater airflow to the larger 395mm front and 396mm rear brake discs. 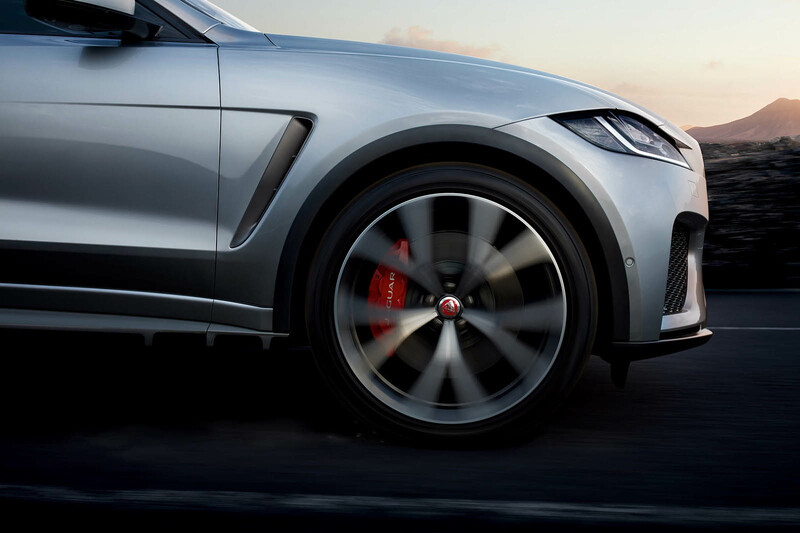 Again, the two-piece discs were constructed to a new design to be lighter and thereby enhance the F-Pace SVR’s handling, although Jaguar has not revealed the scale of the weight savings. Continuing the theme of saving weight, the F-Pace SVR features an exhaust that is 6.6kg lighter than the standard car’s, as well as allowing increased gas flow to reduce back pressure and extract more performance from the car. 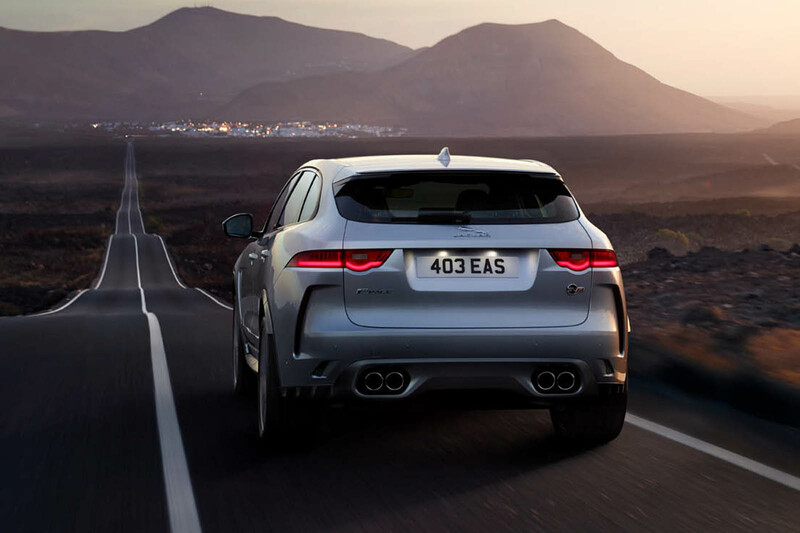 The system also features Jaguar’s so-called Variable Valve Active Exhaust, which generates enhanced sound as more focused driving modes are selected. Aerodynamic enhancements include larger air intakes at the front and side of the front bumper. These lower pressure in the wheel arches, reducing lift and providing extra cooling while optimising high-speed stability. The bonnet is also resculpted and features vents to extract hot air from the engine bay. At the rear, the remodelled bumper houses quadruple tailpipes and incorporates side strakes that aid aerodynamic performance by smoothing airflow away from the rear of the vehicle. The F-Pace SVR also has a distinctive rear spoiler to reduce lift and drag and aid high-speed stability. Inside, the car is differentiated from standard models by lightweight front seats, which provide enhanced lateral support and feature an embossed SVR logo, and the addition of an SVR-branded steering wheel that has aluminium paddle shifters fitted behind it. Buyers can select four bespoke SVR interior colours, ranging from red to pale grey. The rear seats, meanwhile, are also heavily sculpted to hold occupants in place. Interior space and boot capacity remain unchanged. Prices for the F-Pace SVR start from £74,835 and the order books open today (28 March), with first deliveries due in July. The Macan Turbo Performance Package costs from £69,505, the GLC 63 S from £66,905 and the Stelvio Quadrifoglio from an estimated £67,000. The arrival of the F-Pace SVR crowns the F-Pace range and underlines how quickly Jaguar has become a serious player in the burgeoning SUV market, despite only launching one in 2016. Last year, Jaguar sold 76,350 F-Paces globally, more than 50% higher than the total number of Jaguars it sold in 2011. The model also accounted for 42% of all Jaguar sales in 2017 and scooped the World Car of the Year and World Car Design of the Year awards, which are regarded as having a knock-on influence on opinions of the whole Jaguar range. Intriguingly, Jaguar has described the F-Pace SVR as “the fastest and most powerful F-Pace yet”, suggesting that even quicker versions – perhaps in the vein of the Project 7 F-Type and Project 8 XE – could be possible. Jaguar should have been spending their time sorting out the interior fascia design, than making the car go faster. it was the quality that was a bad let down which appreantly has been getting better over the years. The design won’t be changing before a fully fledged facelift, which would be due early next year. Personally its too German for my liking so I would rather wait for a facelift. Personally I thought the Jaguar interiors were excellent. Fresh, clean design. The outside just looks superb. Classic design. Autocar just itcthing to give this car 6 stars....5 just won't be enough anymore. 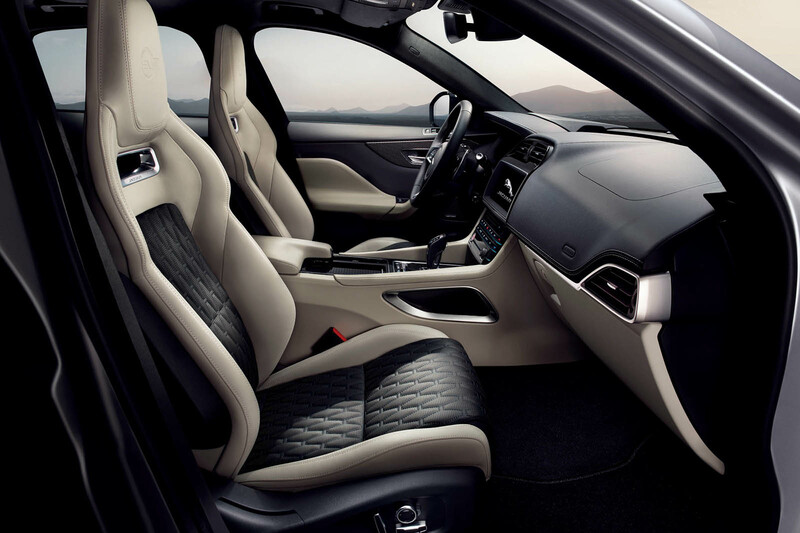 Was never a fan of quilted Leather, a bit old fashioned,and two coloured seats are equally as bad.This and I’m not a fan of SUV’s isn’t have bad looks aggressive got that grrrr factor. Why so much on Jag, how much are they paying. The Alfa Stelvio Quadrifolio review has disapeared from the home page after one day to be replaced by all this Jaguar stuff. Surely, as a direct competitor the Alfa's review should have stayed on the front page for comparison purposes? Or is it because the Alfa is better? really? Jaguar has actually launched something today. Mercedes has 2 without launching nothing today and all the article (bar jaguars and a Toyota) are almost German. Plus why no mention on the reliability test or the emission cheating scandal. Don't know why Jaguar decided to premium price everything. Isn't the 100K Cayenne Turbo a nearer rival to the F Pace on the size front?